To be able to find a sequence of records such as these is a very gratifying experience for anyone doing their genealogy. These records gave us the knowledge of what was before only a rumor, that my grandmother had made a return trip to Odessa. "We have hundreds of documents in our files. Below is a sampling of a few." 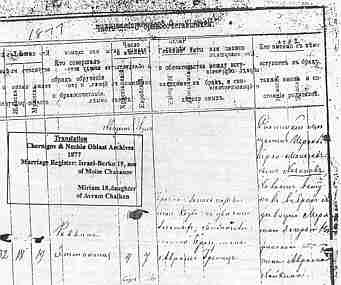 #1..Translation..Chernigov & Nezhin Oblast Archives, 1877, Marriage Register: Israel Berko 19, son of Moise Chazanov and Miriam 18, daughter of Avram Chaiken.